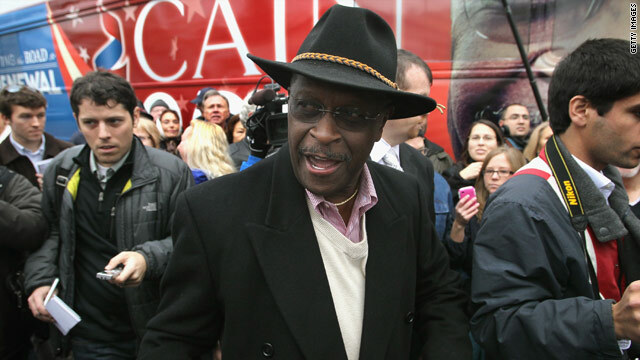 Atlanta, Georgia (CNN) - Hours before the second Republican presidential debate of the week, GOP candidate Herman Cain previewed his foreign policy bona fides before a group of young Republicans in his home state Saturday morning. At the fall meeting of the Georgia Young Republicans in Atlanta, Cain said once elected president he would make foreign policy and national security his priority, saying the president's number one job is to protect the nation. He said his foreign policy approach would be an extension of the late President Ronald Reagan's philosophy. While Reagan's philosophy was "peace through strength;" the Cain philosophy will be "peace through strength and clarity," he said. "We must clarify who our friends are, clarify who our enemies are and stop giving money to the enemies," Cain said. "We must clarify who our friends are so we can tell the rest of the world who our friends are, so they will know who we're going to stand with, starting with Israel, we will stand with. They are our friends." Tonight's debate at Wofford College in Spartanburg, South Carolina will focus on foreign policy and national security, subjects for which Cain has received criticism in the past. Cain criticized the Obama administration's foreign policy as "foggy" and said the White House is experiencing a leadership deficiency. Arguing that Obama lacks the leadership skills of other great presidents in the country's past, he told the Atlanta group how John F. Kennedy inspired the nation with a space technology plan and the promise of sending a man to the moon. "He didn't say we might, he said we will," Cain said. "Only for this president to move us back by canceling a major part of the space program. I can tell you we are not going to bum a ride into outer space with Russia"
Battered by allegations of sexual harassment and more recently for making a reference to Anita Hill, the woman who accused Supreme Court Justice Clarence Thomas of making unwanted sexual remarks, Cain kept to his message today touting his '9-9-9' tax plan, He touted himself as the only candidate with a bold economic solution on the table for the country, which includes throwing out the current tax code. "It has been an albatross around our necks for decades," he said. "But nobody has been bold enough to say let's throw the sucker out. Well I'm saying let's throw the sucker out. " Cain said he had never thought of running for the Oval Office until after President Barack Obama was sworn in, and he saw what he called Obama's "arrogant disregard for the American people." He also credited God with helping him arrive at the decision to run for president. "When I finally realized that this was God saying what I needed to do, I was like Moses: 'You got the wrong man, Lord. Are you sure?' But once I made the decision, I never looked back," he said. Where in "God's" name does Herman Cain get off lecturing Obama on leadership skills – I mean seriously! Cain is like one of those cardboard cutouts of "celebs"that street photographers pose you next to...flat,one-demensional, and totally phoney. He has always been nothing more than a "front man"...all image and no production. He exists today only to give the rightwing a bit of "ethnicity"they can put on display. They don't want a Powell or Watts or Rice ; too hard to dispose of when the event ends. When did the Koch brothers become gods? Oh, yeah. I forgot the repubs have their own holy trinity, the Koch brothers and Norquist. Why does every whackjob Republican presidential-wannabe say that God told them to run? I'm pretty sure God doesn't give a rip who the President of the United States is. As for Cain, his foreign policy sounds just as stupid as his economic policy. Is China an enemy or a friend? Is Russia an enemy or a friend? The answer is "both". We cooperate with them on some things, we oppose them on others. Good luck providing "clarity" around that. How is it possible that the same God has told Perry, Bachmann, and Cain that he wants them to be president?